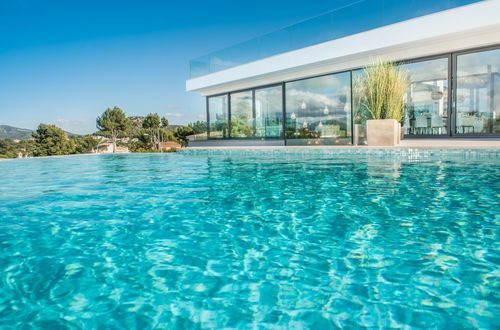 This luxuriously equipped designer villa is being built in an exclusive residential area of Nova Santa Ponsa. The modern architecture blends perfectly with Mediterranean natural stone elements and fits harmoniously into the subtropical garden with the refreshing saltwater pool. The ground floor comprises three bedrooms, one with en suite bathroom, another bathroom, a guest toilet and an entrance hall. From here you have access to two terraces, a summer kitchen, the garden and the pool area. On the upper floor there is the master suite with elegant bathroom en suite. The rest of the floor is covered by the large, open-plan living room with dining area and modern fully equipped kitchen, as well as two terraces on both sides. Floor-to-ceiling windows, clean lines, light natural stone floors and solid wood carpentry provide a pleasant feel-good ambience. The roof terrace is undoubtedly the highlight of the property - it boasts a gorgeous view over the bay, the Mediterranean Sea and the mountains. A fully fitted summer kitchen with goods elevator invites you for Barbecues and dinner parties under the open sky. Close to this first-class property you will find a wide range of sports and leisure activities, as well as many restaurants and shops. The new exclusive marina of Port Adriano and numerous beautiful sandy beaches can be reached in a few minutes.